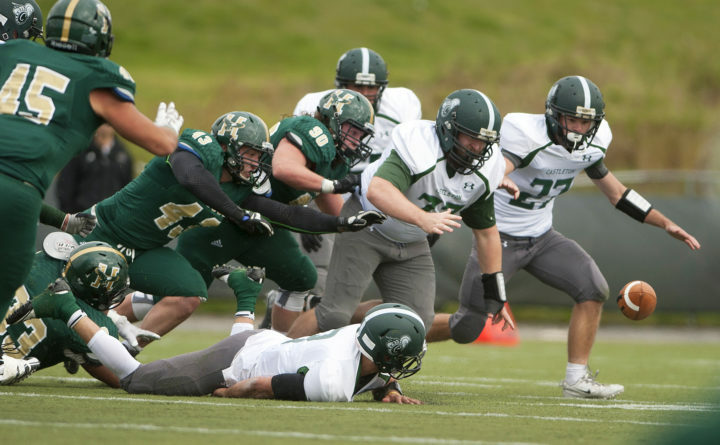 Husson University and Castleton University are pictured during a game in 2015. The Eagles entertain Western New England University on Saturday in their home opener. Game notes: This is a developing rivalry in New England Division III, with Western New England defeating Husson in a 2016 NCAA tournament first-round game, then rallying from a 14-0 deficit to edge the Eagles 21-14 in a regular-season clash at Springfield, Mass., last season. This is the first meeting in Bangor, but the two programs will become perennial foes in 2019 when both join Commonwealth Coast Football. Both teams reached the NCAA tournament last fall and both were eliminated by the same opponent. Delaware Valley defeated WNE 35-0 in the first round and Husson 37-15 in the second round after the Eagles beat Springfield 23-21 for the first NCAA tourney win in program history. WNE has a first-year head coach in Jason Lebeau, its offensive coordinator the previous six seasons. Husson is led offensively by reigning Eastern Collegiate Football Conference rookie of the week Hassen. The first-year running back rushed for 245 yards and two touchdowns during the Eagles’ 47-7 win at the University of New England in Biddeford last Saturday. Time, site: 1:30 p.m. Saturday, Clean Harbors Stadium, Buzzards Bay, Mass. Game notes: Mass. Maritime holds a 26-19 advantage in the battle for the Admiral’s Cup since their first NCAA meeting in 1973. The series has been quite streaky as Mass. Maritime won seven straight games between 1997 and 2003 and Maine Maritime answered with seven straight victories from 2004-2010. Mass. Maritime won the next four before MMA won in 2015 and 2016. Both teams are coming off season-opening losses to SUNY Maritime, MMA by a 36-8 count at Castine on Sept. 1 and Mass. Maritime 51-21 on the road last weekend. Maine Maritime freshman Horton broke a 38-year-old school record in the opener with an 81-yard punt. The Mariners are coming off a bye week.